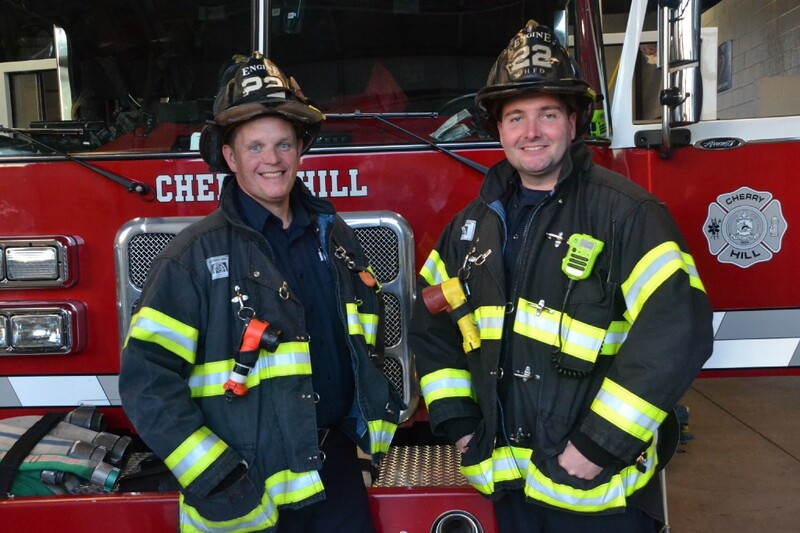 The two Cherry Hill firefighters share how they got into firefighting, what they love most about the job and how many different types of tasks they have to be prepared to handle. Cherry Hill firefighters Jim Aleski and Phil Cook were dressed up in their fire gear for the open house at Cherry Hill Fire Station 22 last Tuesday. Each year for Fire Prevention Week, the six stations of the Cherry Hill Fire Department open their doors to residents, giving them an inside look at equipment, vehicles and what their firefighters do every day. The residents who attend these open houses are typically families with young kids whose eyes light up with wonder when they walk up to a massive fire truck or get to meet one of their neighborhood firefighters. This fascination with firefighting is what paved the way to a career for Jim Aleski and Phil Cook, firefighters working at Cherry Hill Fire Station 22 on Kings Highway. Both remember how they loved being around the firehouse when they were a kid. A firefighter’s job involves so much more than battling fires. Aleski said firefighters could be asked to do anything on a given day. On any given day, a firefighter could be asked to replace a smoke detector, pump water out of a basement or respond to a medical emergency. Then there are the smaller jobs, such as replacing someone’s bike chain or flat tire. Cook said the best part of all these tasks is interacting with the community and getting to make a resident’s day better through a simple act. The life of a firefighter is busy. When firefighters are not responding to calls, they are usually working on a number of other tasks. The toughest part of the job for Aleski and Cook is the number of hours they are away from their families. Despite having to make sacrifices, Aleski and Cook both love their jobs. They are reminded of their importance in the community any time they help someone in need.